Chemical shrinkage: what it is, how to calculate it and how to measure it? Bulk volume change: how do well conditions affect the bulk volume changes of cement and what are the consequences for zonal isolation? How can expanding agents be used to improve zonal isolation? There are several areas where expanding agents are used to improve zonal isolation, and these will be discussed in the following sections. Before addressing the well situation, a reminder of what happens to a ring or material when it expands. The diagram below shows what happens to a ring of material when it expands freely. The thickness (difference between the inner and outer radii) of the ring increases but the internal diameter of the ring also increases. Free expansion of a ring of material leads to a thicker ring, but the internal diameter increases. 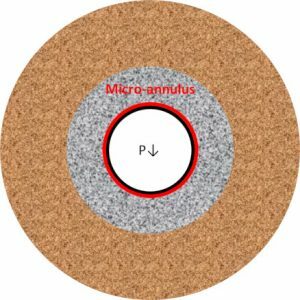 If this ring of material was expanding cement then without any constraint at the outer surface (free expansion) it would expand away from the casing, increasing, and not decreasing, the size of the micro-annulus. Fortunately, in well applications the cement is constrained to some extent by the formation (or casing) at the outer surface. In a typical well situation as the cement expands a stress will be generated at the cement/formation interface tending to push the interface outwards. The movement of this interface will depend on the Young’s modulus of the rock (Erock). The higher Erock, the smaller the movement of the interface. The expansion of the cement will lead to an increase in the thickness of the cement sheath; for a given average stress in the cement the lower the Young’s modulus of the cement (Ecement), the higher the expansion. If the cement sheath thickness increases by more than the outward movement of the cement/rock interface, then the size of the micro-annulus between the casing and cement will decrease. The effect of the Young’s modulus of an outer confining material on cement expansion is shown in paper SPE87195. The figure below is a collation of data read from figures 6 and 14 of the paper. 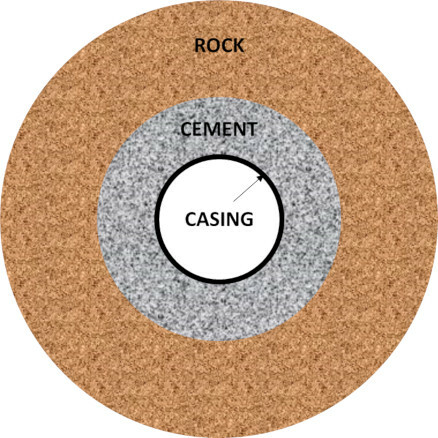 The same expanding cement system (S4 of the paper) is placed in the same experimental apparatus except that in one case the outer confining steel ring is 2 mm thick (equivalent rock Young’s modulus of 2500 MPa) and in the other the steel ring is 7 mm thick (equivalent rock Young’s modulus of 10000 MPa). The expansion of the cement is measured over 3 days via strain gauges attached to the inner core and outer rings. 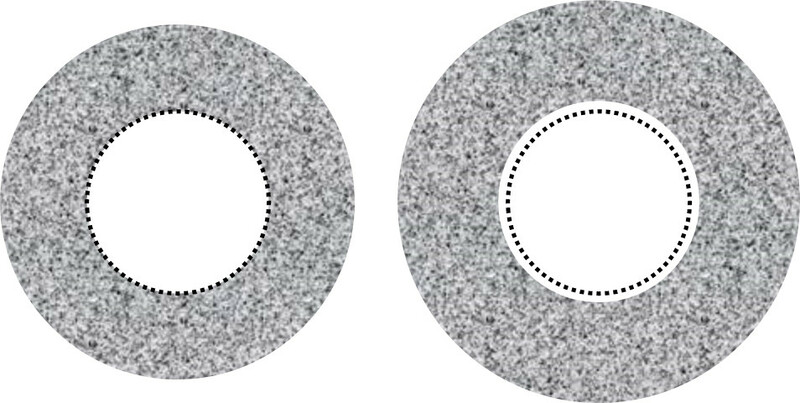 The data shows that the thinner outer ring is pushed outwards more than twice that of the thick ring. In this case the Young’s modulus of the cement is lower than that of the equivalent formation so the cement does not expand away from the inner core. Creation of a micro-annulus may occur a few days or several weeks after cement placement. In the first case most of the expansion will likely occur after the micro-annulus has formed, whilst in the second case expansion is likely to occur with the cement confined between the casing and formation. In this scenario the expansion occurs under unconfined conditions and the split ring test, described in API RP 10B-5 or ISO10426-5, is an appropriate method to determine the cement expansion. The split ring provides little resistance to cement expansion outwards. There is currently no industry accepted method to determine expansion under confined conditions. The difference in free and confined expansion has been demonstrated in SPE87195 and SPE56535. For example, the system S4 from SPE87195 discussed above has a linear expansion of around 0.4% (4000 microstrain) after 3 days, but in the confined situation the total linear expansion is between 150 and 300 microstrain, depending on the degree of confinement. As well as the methods described in the papers cited above, paper SPE170306, describes a method that could be used as a basis for a new recommended practice. Very little field data is available demonstrating the effects of expansion over time. One example of improved bonding with time is shown in a Schlumberger Oilfield Review Article, “From Mud to Cement – Building Gas Wells”, Autumn 2003, P62 to 76. 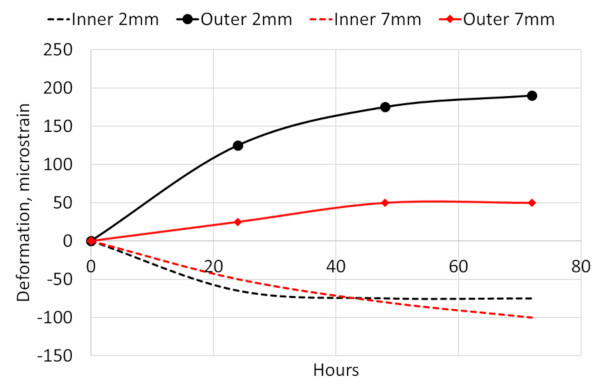 In this example, cement evaluation using an ultrasonic imaging tool at a 2-month interval shows reduced micro-debonding (Figure P74). Wellbore pressure or temperature increases will cause casing to expand outwards, inducing tensile stresses in the cement which could ultimately lead to tensile failure of the cement sheath and generation of radial cracks. Expansion can be used to decrease the risk of tensile failure by placing the cement initially in a compressive state of stress. This has also been demonstrated in SPE87195 where an expanding cement system did not fail in tension, but the same system without expansion failed. For zonal isolation it is unlikely that radial cracks will grow sufficiently along the axial direction to provide a continuous path for fluid flow. However, once radial cracks are formed, they do not close completely and may lead to the formation of a micro-annulus at the casing/cement interface. The presence of a micro-annulus poses a far greater risk of loss of zonal isolation. The application of expanding cement systems in plug applications is technically easier. There is no inner interface so there is no need to worry about the formation Young’s modulus. However, in this case the most important parameter of cement expansion is the stress that it generates at the cement/rock or cement/casing interface. The higher the stress at the interface the better the sealing capability of the cement system, all other factors being equal. The challenge with plug applications is the larger volume of cement and the risk of autogenous shrinkage. As has been show in SPE97347 and discussed in the previous article cement slurries can be designed with high water:cement ratios and expanding agents to minimise the effects of autogenous shrinkage.